Many congratulations to Lucy for her first place at Sunday’s Liverpool Century Road Race (Cat W2,3,4). With Angela Hibbs and Ellen McDermott of Team WattCycle – both 2nd Cat riders coming second and third. “A comfortable win from where I was standing” — Matt Limacher. Bravo – and huge congratulations. If you would like to know more – either contact our coaches, head over to the Facebook Group, or contact Marsh Tracks directly. Get involved. 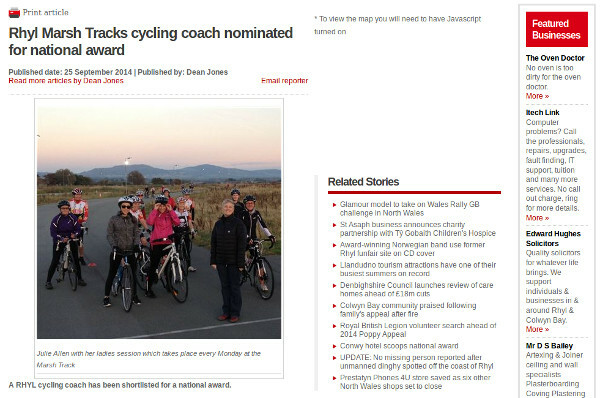 Julie has been nominated for 2014 Welsh Cycling Coach of the year no less. While she is it at great pains to point out she could not have done it without the support of the other coaches, we are super proud to have her as a member of the club, as a coach, and for her to be nominated for such a prestigious award. Well done Julie! Further to the improver’s session – let us not forget the Monday night Ladies sessions at Marsh Tracks. Two great classes serving our growing and diverse club. For those unfamiliar with what goes on – its a skills and fitness based class for all riding abilities. “Two great sessions last night, Mark and his group were doing interesting things with limbo poles, and no hands, and Alan had us doing tight cornering, and a pursuit chase (for fitness, he says)! Unfortunately for us ladies, Alan will not be coaching on a Monday night any more, as he has the Project 2018 group to do on a Tuesday, and the new Improver session on a Thursday. So, I for one would like to say a big thank you to him, the sessions were his idea, and his coaching input has been invaluable. As always – bikes are for hire, but subject to availability.